The time was coming, when Mavis would leave this world in much the same way she arrived… with nothing. However, Mavis had her own ideas. If the Chinese Emperors could take their terracotta armies and the Egyptians had their slaves, Mavis was going to be buried in her lounge room in her own Empire. “Mother, we’re going for a drive,” her daughters chimed in unison. Although they were middle-aged, Mavis always knew there was trouble whenever they palled up. There was no way they were taking her to a nursing home. She’d die first. This has been another contribution for Friday Fictioneers. PHOTO PROMPT © Rochelle Wisoff-Fields. This entry was posted in Friday Ficioneers, Parenting, Writing and tagged death, dying, family, family history, Happy Birthday, mom, mother, mum, Nursing home, parenting, parents, retirement on May 23, 2018 by Rowena. Playing the organ on a frosty Sunday morning, Audrey sat the bulky hymnal on the front seat of her battered Toyota Corolla, and struggled to get the key in the ignition. Her eyesight wasn’t what it used to be. Although her vision was patchy, the Church was only two blocks away. She could get there blindfolded. “No, thank you love,” she smiled. She’d heard about the Audrey roster. Next they’d be calling her son. She’d burned her bra in the 70s. No one was confiscating her car keys. This entry was posted in Blogging, Christianity, Compassion, Health, Parenting and tagged cars, Christianity, Church, driving, elderly, family parents, grandma, old, organist, parents on May 11, 2017 by Rowena. Centre of Our Universe: Day 4: Five Photos, Five Stories Challenge. Then, there’s the “before the baby arrives” holiday and the one before the next baby arrives. While anticipating our daughter’s grand entry into the world, we flew down to Tasmania with Mister and stayed with Geoff’s cousin in Brdport, NE of Launceston. Geoff grew up on a 10 acre farm in Scotsdale. He is a dyed in the wool Tasmanian and has the scar tissue to prove it. His family has been living in Tasmania since the 1830s and includes free settlers as well as a convict who was accomodated at the notorious gaol: Port Arthur. So, continuing the theme of posting photos of us behind the lens, here is Geoff photographing Mister at St Columbas Falls, Tasmania. From memory, I think Geoff was photographing the falls when Mister jumped in front of the lens, insisting on being the subject. Didn’t like being ignored! Reminds me of how dogs sit in front of the TV driving you crazy trying to get your attention. Even though this blogshare is about sharing one photo a day, I couldn’t resist adding this photo of Mister, which conveys his dare-devil spirit. He isn’t quite so daring these days but he still has an eye for adventure. 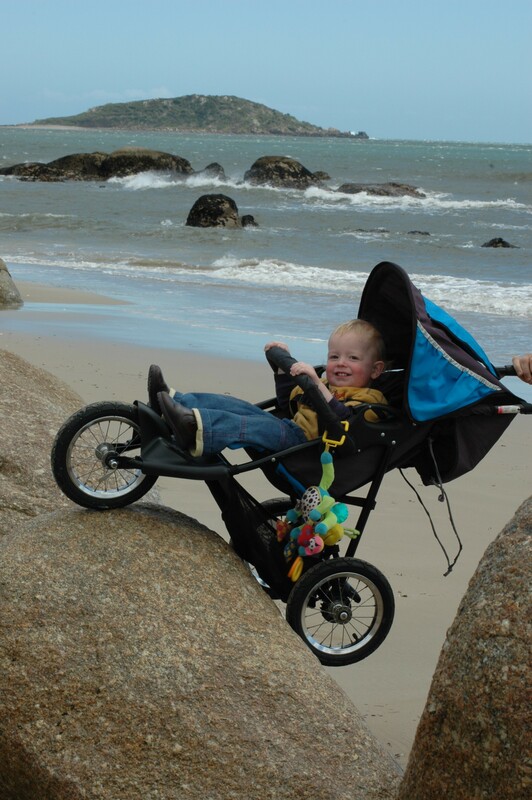 It was taken at Tomahawk Beach in NE Tasmania, which is 111 km NE of Launceston and looks out onto Bass Strait, which can be a gruelling patch of sea..
Mister, Tomahawk, Tasmania aged 18 months.Has pram will travel! I am, having a ball trawling through old photos for this blogshare and am truly coming to realise how much work lies ahead sorting our my photos into some sort of retievable system. This is proving quite a challenge. In case you hadn’t noticed, “systems” is a foreign concept. This entry was posted in Parenting, Photography, Travel and tagged Australia, children, family, family history, kids, love, Nikon, parents, photo, photography, Tasmania, travel on June 13, 2015 by Rowena.